This preliminary study suggests that health sector spending is skewed towards non-Māori children despite evidence of greater Māori need. Our study shows that in addition to being preventable, unnecessary and a breach of child rights, inequities in child health result in significant costs to our society. Specialist outpatient visits by Māori children 86% lower than those of non-Māori children. Every day I hear examples of how our people are made to feel stink, or embarrassed, angry, or forgotten through various experiences they have had with the doctor, or with schools or through a wide and varying range of basic services of necessity. Sometimes institutional racism is about what we imagine too though, the way we can frame a situation in our thoughts. I don't know about other white people, but I continually find myself wrestling with internalised white dominant ideas, ways of thinking that position Pakeha ways of doing things as normal, natural and right. Economists have proven it's cheaper to let Maori children die than spend money to provide equitable health treatment. It's hard to imagine why you would begin an article about research showing one group is disadvantaged by talking about it being cheaper for the disadvantaged group to die. It's hard to imagine that sentence not causing an uproar if we were talking about white people. Yet the article caused barely a ripple. For me, that's a disturbing indicator of why Aotearoa can allow such appalling institutional racism in our health system in the first place. * The title of this blog is how it pops up in Stuff, but the title of the article is different. I don't know if that means Stuff changed the headline after posting? That is what it would mean in a blog link. Don Brash took this junk piece apart on Facebook about two weeks back. The real problem is Maori Parents not looking after their kids well.....There's no excuse for that with the disproportionate welfare and subsidies they get from the rest of us. That isn't a "colonisation indicator," it's a "single parent on a benefit" indicator. The reason Maori kids are doing proportionately badly is because there's a high proportion in that category, not because of racist Whitey running the health system. As to the headline,the subeditor looked for the most contentious and alarming bit to grab readers' attention - that's their job. The article failed to live up to the alarming headline, as usual, but the headline was a success because we read the article. Farrel - blaming individuals for systems that produce inequality is pretty bloody convenient, don't you think? And makes no sense at all when you look at figures like these. "The real problem is Maori parents not looking after their kids well"
How do you expect them to do that when they've been systematically disenfranchised and oppressed for over a hundred years. You can't deny someone basic support and resources and then turn around and say "well it's your fault for not making good with what you had". @Psycho Milt - see above for reasons why Maori feature disproportionately in that group. Colonisation was the catalyst and reinforcing factor for all the problems you see today. Or are you trying to tell me that Maori people we all solo parents on a benefit before white people arrived and started shafting them? Yeah, didn't think so. No, see above for a correlation you find "convenient," as LJ calls it. A hefty proportion of Maori kids living with single parents and unrelated adults on benefits is a recent development, something that's happened in the last few decades - if you're looking for causes of that, "colonisation" isn't a strong contender. Really Psycho Milt? Breakdown of cultural supports to child-rearing, including more communal ways of bringing up kids, not related to the kinds of houses colonisation introduced? Pepper-potting in the 1960s and 1970s not relevant - where Maori families were forced to live separately from each other when they migrated into urban areas for work? An education system that hit children for speaking Te Reo, as recently as two generations ago? An education system that teaches using a western European model, and at least in my experience, almost completely western European history, readings, knowledge? 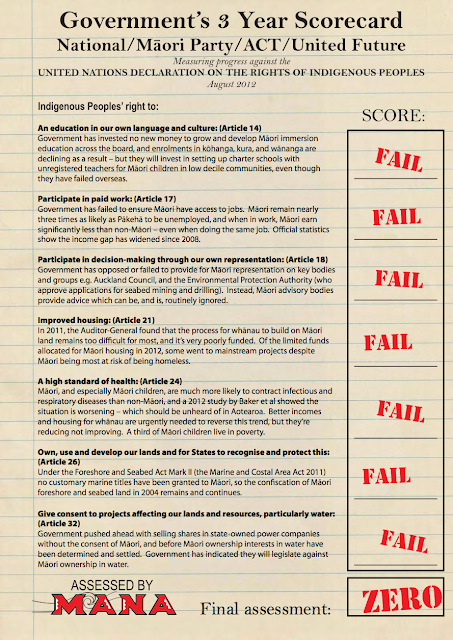 The position of Maori as a group in this country is all about colonisation. Sure, all those things have an effect, and no doubt that effect includes poorer health outcomes. However, the rise in poor child health and the return of third-world diseases is a recent phenomenon, as is the rise in children in single-parent/benefit/unrelated-adult households. Those two things aren't unrelated. You could perhaps make a case for the increase in Maori single parenthood being a consequence of the degradation of their society by colonisation, but Tariana Turia regards that view as white supremacist thinking so it's certainly not a case I'd make. This may not be that relevant in the big picture, but argh this always hits a nerve with me - Maori children needing special treatment with healthcare, education etc. My kids are 1/4 Maori, and I don't like that statistically they are stigmatised as likely to be lacking things, or not expected to do as well in life because of their ethnicity. Hey Melissa, yep, I hear you - and I work with many fabulous Māori practitioners who talk about how difficult it is to always be described in deficit terms. I'm not sure how we acknowledge inequalities and the colonisation context without setting up an expectation of cycles of deprivation. It's a good point, thank you.